The Dominican Sisters of Houston co-hosted an interfaith prayer service June 19 at the Dominican Center for Spirituality in response to the shooting at the Emanuel AME Church in Charleston, South Carolina on June 17. 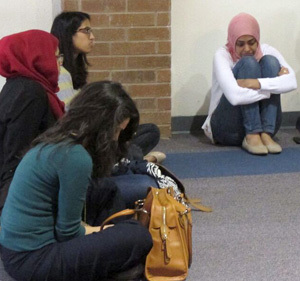 The Council on American-Islamic Relations (CAIR) in Houston organized the event. The previous Sunday, Pax Christi-Houston and the Dominican Sisters had collaborated with the Center for the Healing of Racism in screening “White Like Me.” “White Like Me” is a documentary featuring Tim Wise and acclaimed anti-racist educator and author. Wise explores race and racism in the U.S., through the lens of whiteness and white privilege. He offers a look at race-based white entitlement programs that built the American middle class and argues that our failure as a society to come to terms with the legacy of white privilege continues to perpetuate racial inequality and race-driven political resentments today even though following the election of President Obama, many tried to imply we lived in a post-racist society. As information about the shooting in Charleston, South Carolina, unfolded, it confirmed that racism is very much alive in America. So when Mustafaa Carroll of CAIR (Council on American-Islamic Relations) contacted the Dominican Sisters of Houston seeking their participation and the use of the Dominican Center for Spirituality to convene the vigil, their response was yes. At 4 p.m., members from the Islamic, Jewish, Hindi, and Christian faiths gathered to show their solidarity with the people of Charleston. P.K. McCary, founder and host of Think Peace Radio and longtime ecumenical and interfaith activist, presided. Congresswoman Sheila Jackson Lee came from a Juneteenth Celebration in Galveston after learning of the vigil from the press release. She described the actions from Capitol Hill on Thursday. Congressional representatives joined together to pray and offer words of condolences not as Republicans and Democrats but as Americans. The shooting in Charleston affects all of us. She offered a prayer for healing. As she closed her remarks, she reminded us that this is a time for action. Hers was the first of many that day. While our grief was expressed along with our prayers, many agreed that this is a time for action.